Discussion in 'Winner Stories - Online Gambling Winners!' started by Marina, Dec 5, 2018. Top notch online bingo and casino site, Bingo.com was thrilled to announce that one of its players hit the jackpot on NetEnt’s Mega Fortune Dreams video slot. The lucky player, who hails from Britain, bagged a GBP 4 million bounty on NetEnt’s highest paying progressive slot game. The impressive win was made in October 2018 but was only announced by NetEnt and Bingo.com recently. The online gambling site is part of the industry leading gambling group, Kindred which offers a fantastic range of sports and betting products across multiple brands i.e. Unibet and Maria Casino. The 49-year-old player, who prefers to remain anonymous at this point, headed to Bingo.com and decided to enjoy some quality time at his favorite gaming site. He headed to Mega Fortune Dreams slot and incredibly hit the jackpot from a mere 80 p spin. The player said that one hears about people winning multi million-pound jackpots, however it’s hard to believe when it would happen to anyone one knows. 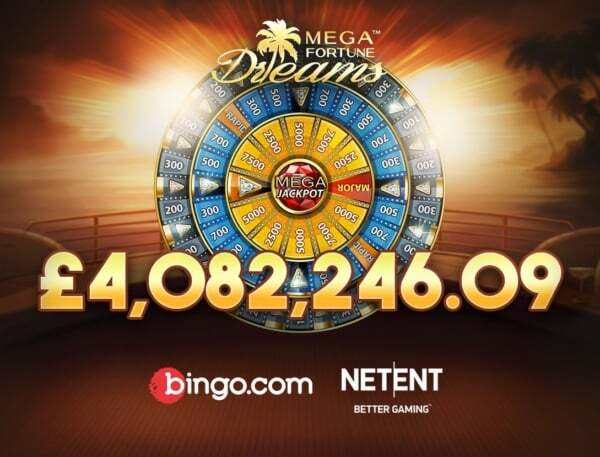 In a press release put out by NetEnt, the company’s chief product officer, Henrik Fagerlund noted that Mega Fortune Dreams progressive slot has certainly lived up to its name by creating another instant multi-millionaire and delivering a life-changing win to the lucky British player. The winner admitted that the win will very likely change his life in more ways than one, and it has already changed other people’s lives around him for the good. NetEnt’s Mega Fortune slot is now reseeded and will continue to grow above the GBP 1 million mark swiftly, as online gamblers flock to casinos to try it out. The news of another big jackpot hit on this game will no doubt see even more players seek it out at their favorite NetEnt casinos, hoping that they, too, will be able to boast about their eye-popping wins.